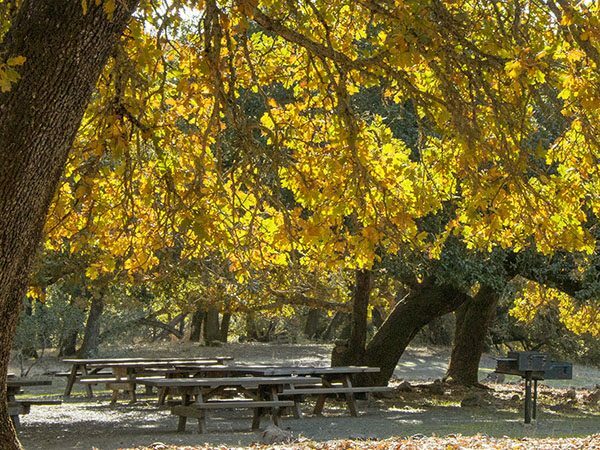 Take advantage of the beauty in the Park with a picnic! Museum parking lot: Picnic tables in the center median of the parking lot make a great spot for a quick picnic. Other locations: Picnic tables are also located at the Wolf House Ruins, the Cottage, and on the knoll above the ranch parking lot. Reservations are required by calling 707-938-5216. Oak Grove: Overlooking the vineyard and stallion barn, this site is a short walk from the ranch parking lot via an accessible path and is sheltered by large shady oak trees. —Provides barbeque stands and potable water. —For casual picnics of 30 guests or less, a $150 non-refundable fee with an additional parking fee of $10 per vehicle. Terrace: Next to the cottage garden. —No barbeque stands or potable water. To learn more and to see more venues in the Park, click here. If the sites are not reserved in advance they are available for all visitors to use.